This is the lovely Yours, Mine, and Flowers by Different Dimension. I can take credit for the name but I had nothing to do with the blend of glitters. I loved this polish so much I wore it twice in a row! 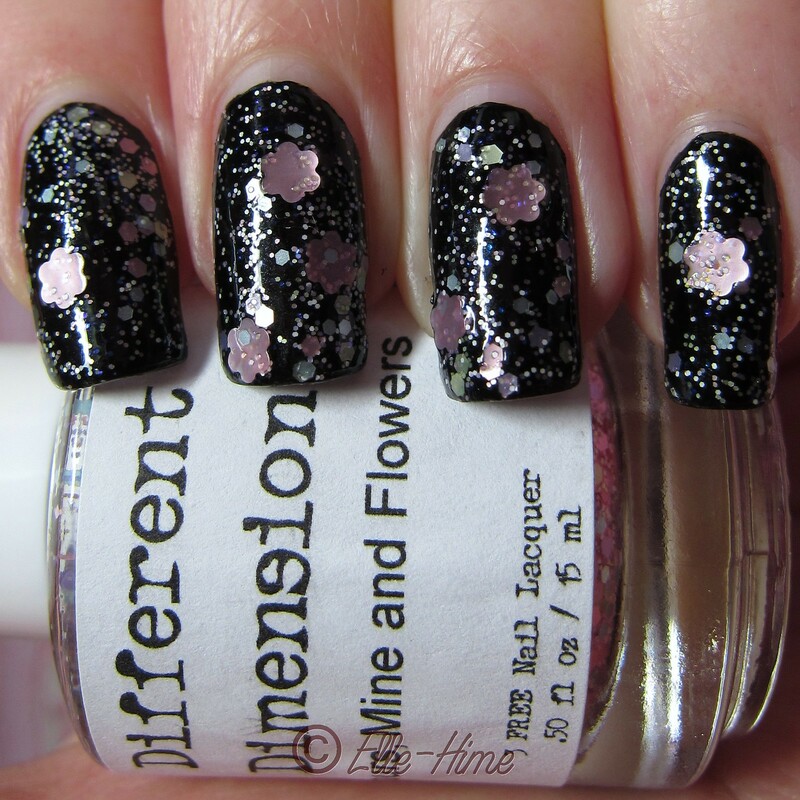 Partly because I wanted my swatches to really show off the pastel glitters, and black was better for that. 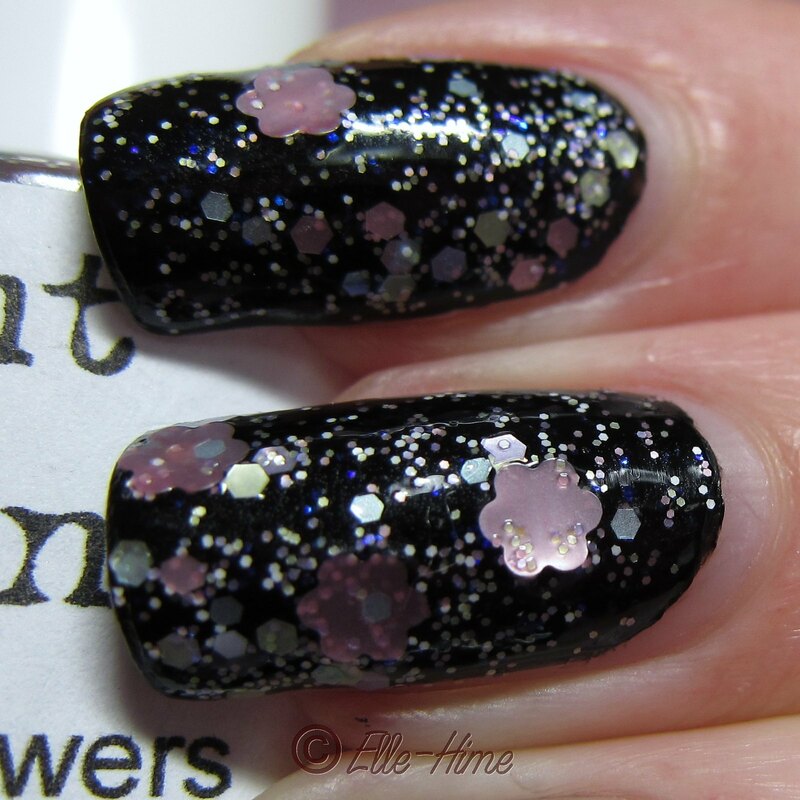 So here is one coat of Yours, Mine, and Flowers over Wet 'n Wild Black Creme. Yes, this really is one coat, and yes, you really do get that many flowers in one coat. Missi knows what she is doing with her polishes! No skimpy glitters here. Also, do you see the bright blue sparks on my nails here? Those are color-shifting glitters. They look more purple in the bottle but they show up blue on my black base. 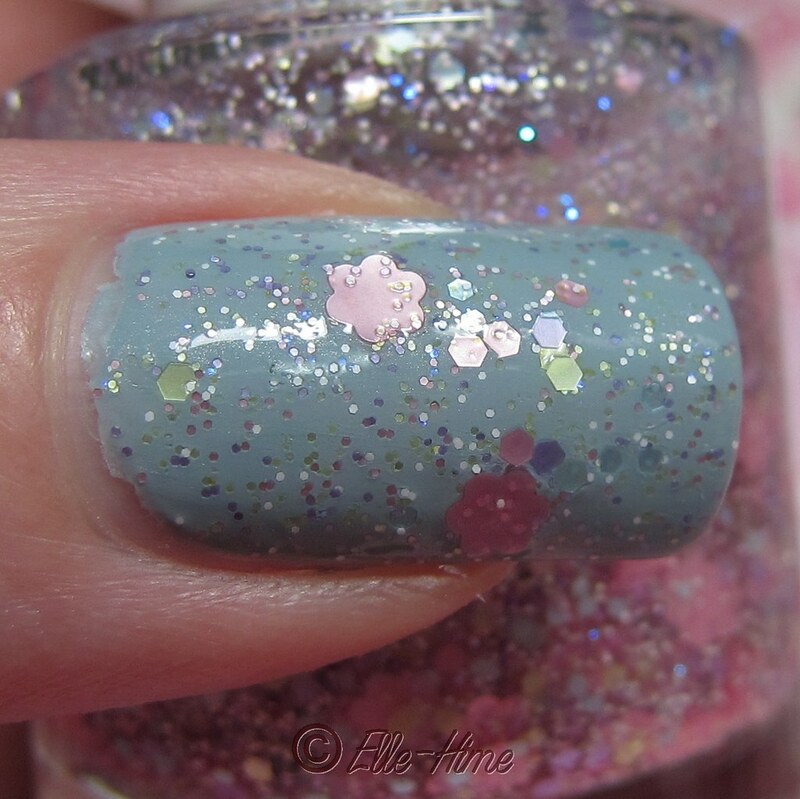 This is how I first wore Yours, Mine, and Flowers - one coat over China Glaze Sea Spray. This winter-sky colored polish gave my nails a much softer and more subtle look. The color shifting glitters only faintly flashed purple. The colors in this clear-based polish are satin finish baby pink, lavender, pale green, powder blue and white, as well as matte white in the tiny glitters. It's a really pretty blend. The formula on this was very good, though it is a little more slippery than some of the other Different Dimension glitters. I had to use a light hand so I wouldn't drag the glitter around, and give it a moment to set. It is packed with glitter, but here is my tip for super-easy flower catching: leave the bottle upside down for a half hour before you use it. Yours, Mine, and Flowers was just added to the Different Dimension etsy shop over the weekend, so you can go pick up your bottle there! Simply gorgeous! 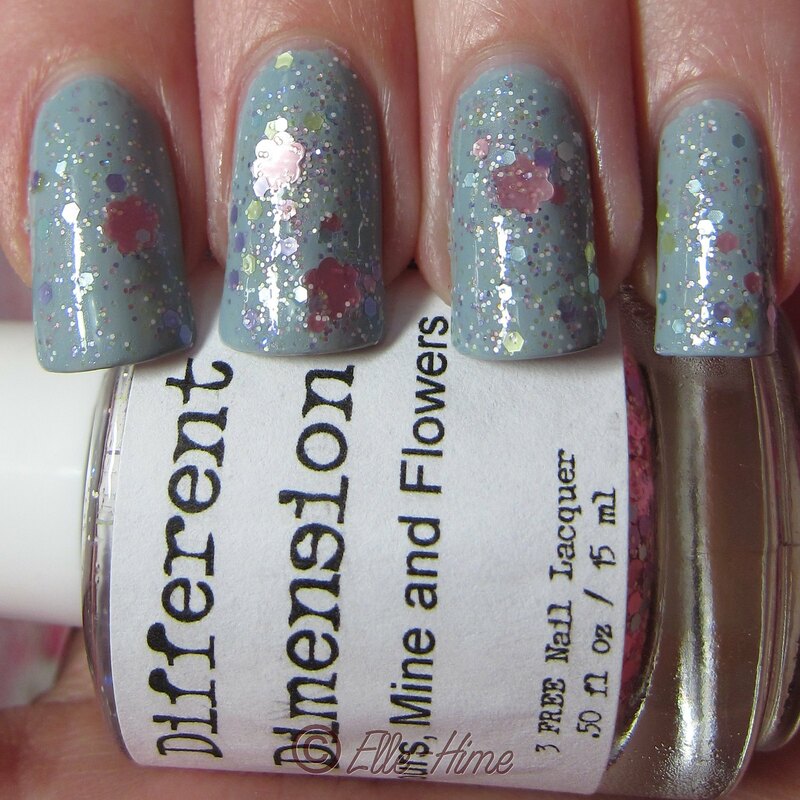 I think I'm going to buy a few Different Dimension glitters. I love them. Gorgeous!!! Thanks for the swatch and review!!! Same here! It definitely is. There aren't high-rises along with the historical society and local building regulations help keep it that way http://0ab.fr/1hus it gives you probably the most cost-effective increasing you might never imagine.